In 1997, ArtWalla began work with City officials to create the ordinance #95-18, "Arts Collection Management," providing the process for public art acquisition. Public art creates a backdrop of beauty and inspiration for our award-winning historic downtown and growing reputation, not only for world-class wine and stimulating cultural events, but as one of the "Best Small Art Towns" in America. To enhance the educational benefit, ArtWalla produced the Public Art Walking Tour and Coloring Book. Download it here for your use. Whitman College campus has an extensive collection of outdoor sculptures. You can find their sculpture map here. 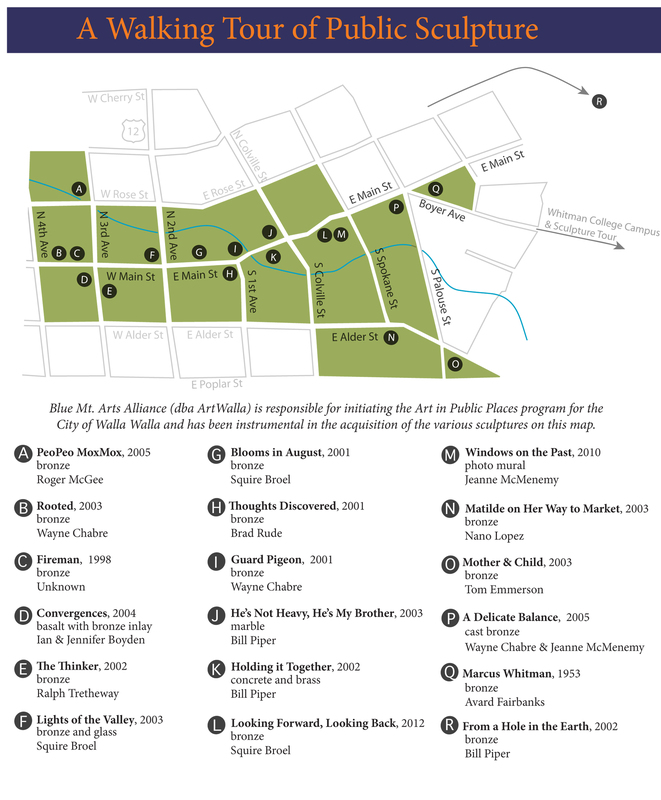 Use the map to find Walla Walla's public art sculptures. Click on markers below to learn more about each piece. Or, click the left and right arrows to move through the tour chronologically. To view the full screen tour, click here. This is best for viewing on mobile devices. You can also download a printable map here.